By: Elizabeth McKenzie (née Buckmaster). The instructions were quite specific. ‘When you get into the village, you’ll see a church and graveyard on your left. That’s not the one’. Of course not! We were following GPS instructions, Irish style. To get to the ‘old’ church and graveyard of Dungourney, which we were seeking, meant driving along a road, reminiscent of Robert Frost’s ‘The road ——less travelled by’. It was distinctly ‘grassy and wanted wear’, its narrowness accentuated by the ubiquitous ivy and fuchsia covered stone walls of some long forgotten demesne, and the branches of equally ancient oak and beech trees forming a tunnel of cool, dappled light. We drove at a leisurely pace, partly because of the (fairly remote) possibility of meeting another vehicle on the single lane road and partly because the combination of hedgerows, walls and lush green vegetation meant that our destination was well camouflaged. Eventually we passed great iron gates, cunningly set into a blind curve of the demesne wall. Further investigation revealed a) a church with a towering, square Normanesque belfry and b) firmly locked and bolted gates. But we were determined to gain entry. A quick reconnoitre for a breach in the wall (quietly disintegrating anyway) revealed a single, heavy iron gate with a very stiff latch which yielded eventually to cajoling, cursing and sheer physical brawn. We were standing in a very old precinct of a (C of I) church and graveyard (which no doubt had once belonged to the Catholics). The church had long ago been abandoned and boarded up, stout doors barring any notion of entry, some scaffolding leaning in a desultory fashion against the crumbling outer walls. 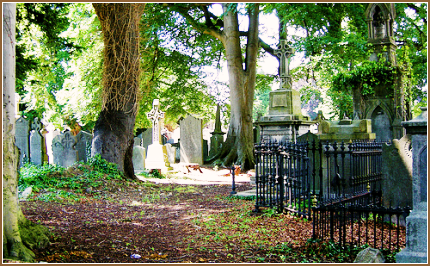 On the right hand side of the church, set in orderly fashion in a peaceful grassy sward were the Protestant graves. The left hand side – where we found ourselves – was more exuberant, a higgledy-piggledy, chaotic jumble of gravestones covered in lichen and moss, punctuated by disintegrating sarcophagi and small unidentified mounds. Here the Catholic faithful were laid to rest. And it was here our mission lay. We were looking for a particular grave. Our Irish GPS had given us fairly specific instructions for further exploration but in spite of this, it was hard to see any order in the allocation of graves. So we wandered hither and thither, becoming embroiled in the grief and sorrow over the losses of loved ones who had died maybe a century or even centuries ago. We peered into the bottomless black hole in the side of an anonymous but crumbling sarcophagus. We tried to decipher, using slate as scrapers, various names and dates. We discovered old graves where the old upright slab headstones had been lovingly restored and at least two ‘family plots’ which had 21st century occupants! And it was nestled in the midst of slightly tipsy, but still upright flagstones in a family plot that we found what we were looking for – my paternal grandmother’s grave. It was marked by a small rectangular stone plaque, the name on it still quite decipherable. While the spouse got busy with his slate scraper, I stood and stared. I had been named after my long dead grandmother, and the name on the small plaque, ‘Elizabeth Buckmaster’, was the name I had borne for almost a quarter of my life. It was as if my long ago childhood came spiralling out of the grave to claim me! I began to weep silently but whether it was for the grandmother I never knew or my own lost youth, I couldn’t tell. The sun had lost its battle with the tall protective trees sheltering the graveyard and the air was growing chill. In the village, a pub, a pint and the land of the living awaited us. But I have begun to mull over the possibility of having my ashes scattered over my grandmother’s grave, thus saving my family from the expense of purchasing a gravestone for me and ensuring an ongoing connection with my ancestors. De ar Elizabeth ( Buckmaster ), You have written a really beautiful piece on your past and family. I was terribly moved by it and its sensitivity and utter res pect for its history and precious view of family. Thanks a million for the privilege of reading it. I will give you a bell soon and catch up. You have contibuted one of the best works of dear Tintean. Love to you and Don the scraper,. Peter.